Building 5 at Northeastern has reached nearly its full height, and we can now appreciate the depth of desecration that the new buildings have unleashed upon Mary Cummings Park. The visual shows the five places from which one or both new structures are visible, and they are so large and dominant that they have rendered much of the park permanently disfigured. The fact that the new structure looms over the wetlands is particularly sad, since we assumed that that part of the park would not be affected, but the buildings dominate the skyline. We understand that The Trustees had plans to build a boardwalk there. With the view permanently marred, it is not clear if they would proceed with the boardwalk. It is true that Northeastern has promised to plant trees in some areas to hide the structures, but the trees will not be evergreens, so they will only be effective from May to October. Also, it may be 50 years before the trees grow tall enough to hide the new buildings. Northeastern said that they had no other choice than to build the buildings in that section of their land, because the unknown state of the missile silos would not allow other siting. From the point of view of this particular board member (Jon Sachs, webmaster) I suspect that is not the true reason. I suspect that they wanted to place the buildings at the highest point in the park so that they would command a view and impress corporate and military visitors. They wanted a monument to their new status as a major university. Consider that they were building inside of a park, and at no time contacted The Friends of Mary Cummings Park, nor even The Trustees of Reservations, who were on the way to being designated park managers. They never considered the effect on the park until we raised loud concerns, but there was nothing to be done. The town simply had no legal recourse under the law. This is a smaller tragedy than many other playing out around the country and the world, but we are The Friends of Mary Cummings Park, and our park has been desecrated forever. It didn’t have to happen. To some extent, we blame ourselves. We were so busy fighting attempts from various Boston powers to sell the park to developers that we didn’t pay attention to Northeastern. It simply never crossed our minds that an educational institution would be as callous and arrogant as they turned out to be. And by the way, they are taking a very similar course in Nahant, but meeting far more resistance, since the area they intend to use for a “trophy” building is widely known and loved in Nahant. It is too late to rescue our park, but things are still in play in Nahant, at this date. The scope of our little tragedy will become more well known as The Trustees begin to manage and publicize the park. 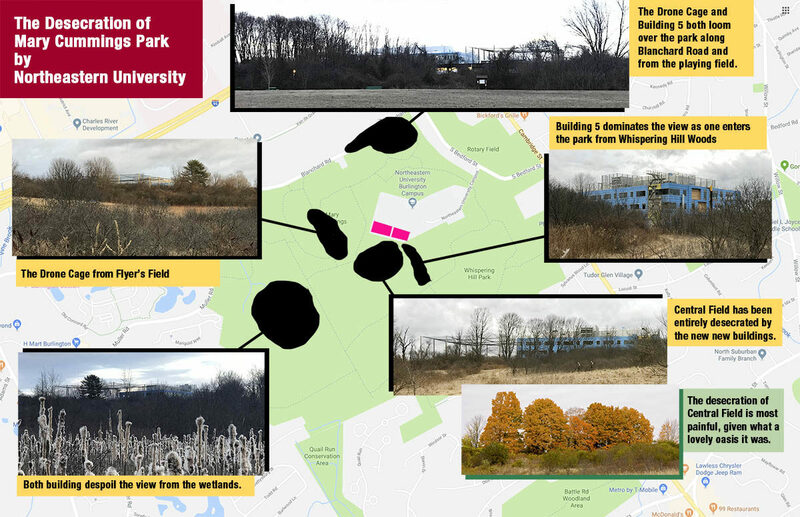 Their ability to “sell” this as marvelous piece of nature, their closest park to Boston, will be forever hobbled by the monstrosities that loom over the park, thanks to the arrogance and ignorance of Northeastern University.